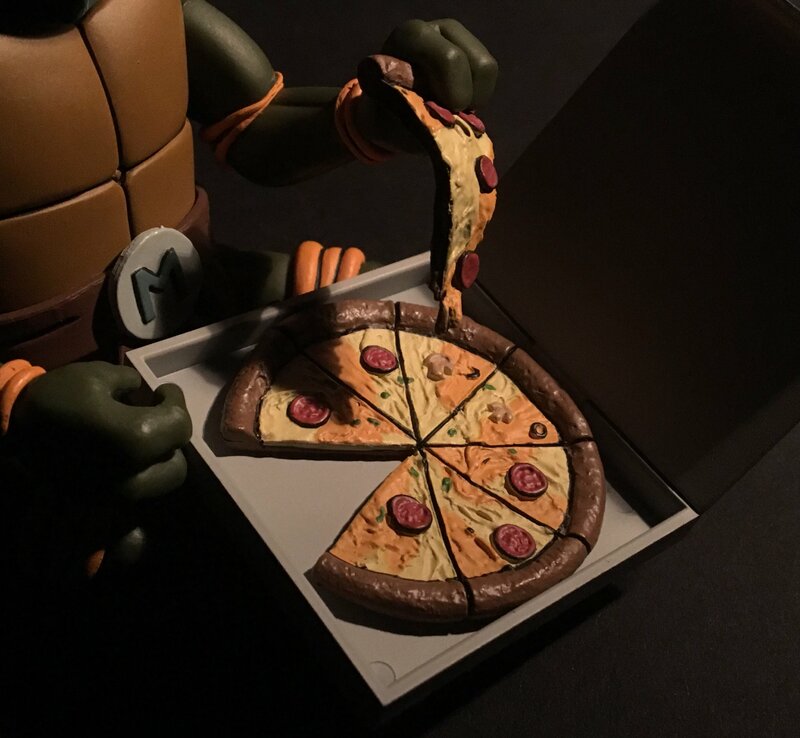 Last week, NECA teased their upcoming San Diego Comic-Con 2017 Exclusive Teenage Mutant Ninja Turtles. 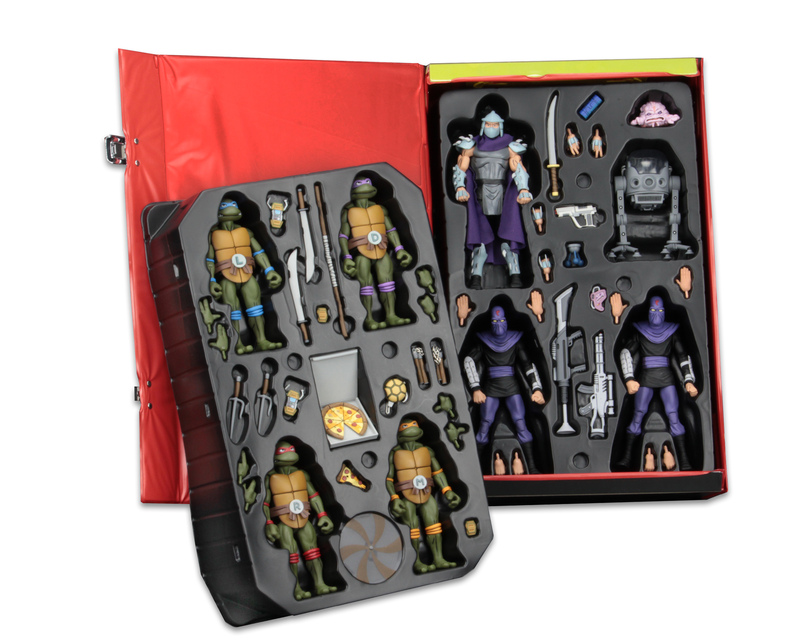 We got glimpses at the four Turtles, Shredder and some of the packaging. 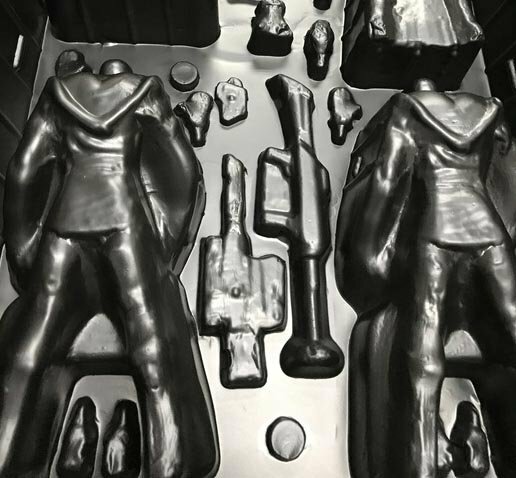 Now we have photos and details for the entire set! 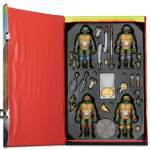 The Fwoosh has released full details on the NECA TMNT SDCC 2017 Exclusive Set. 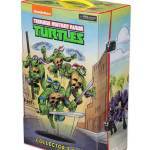 The 8-figure set is based on the characters appearance in the classic Teenage Mutant Ninja Turtles Cartoon Series. 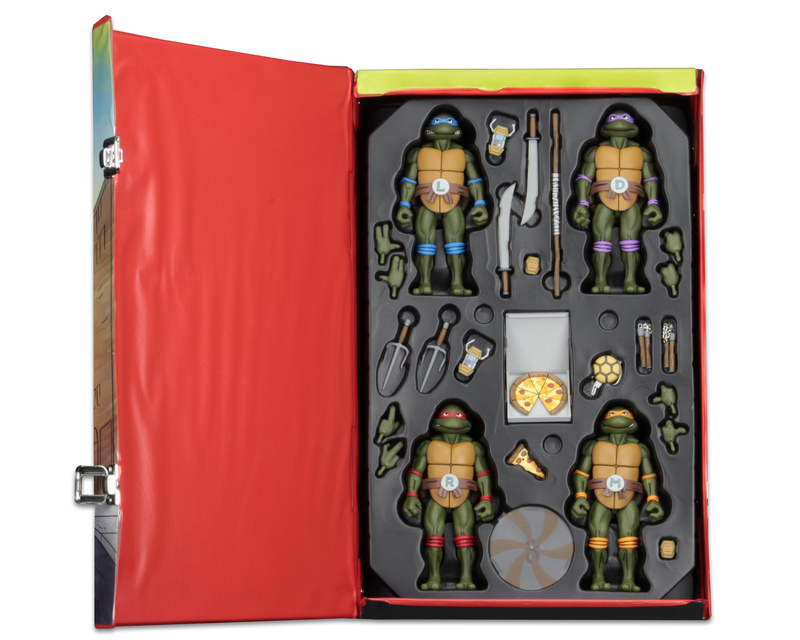 It includes Leonardo, Donatello, Raphael, Michelangelo, The Shredder, Foot Soldiers, Krang and a collectors case. 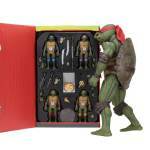 Each figure includes character specific accessories, such as weapons and interchangeable hands. 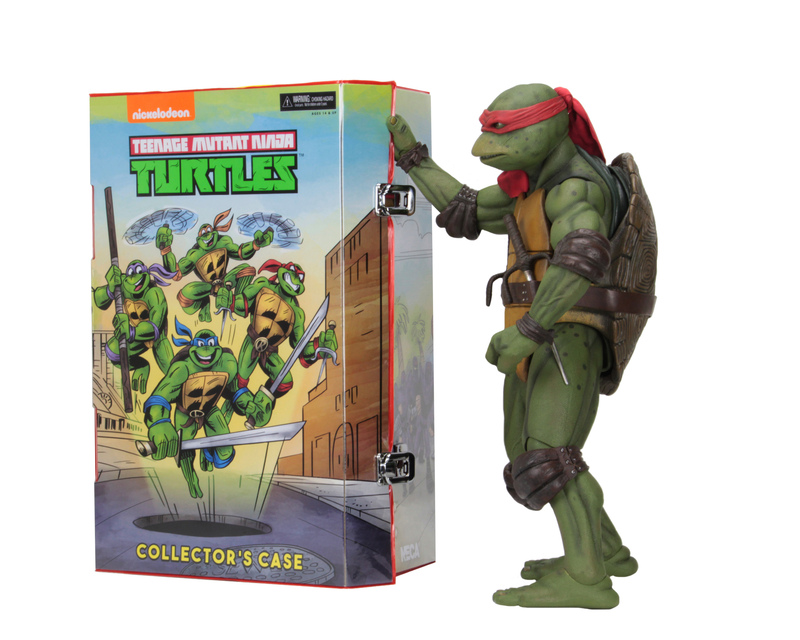 The figures sit on their own plastic trays which fit nicely inside the all new, classic style, collectors case. Fans who aren’t attending San Diego Comic-Con 2017 will have a chance to purchase this set. Details on that are forthcoming. 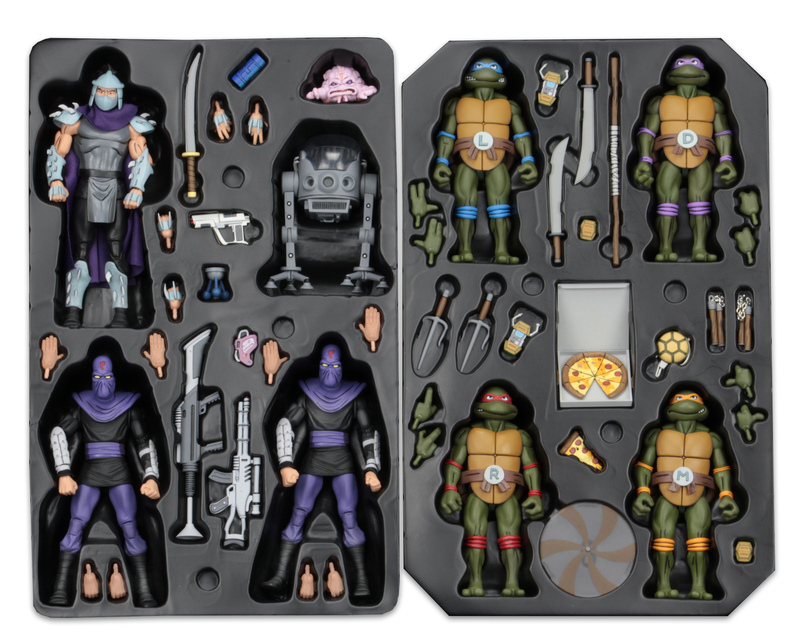 NECA has released some additional details for the set, including the number of sets being made available. 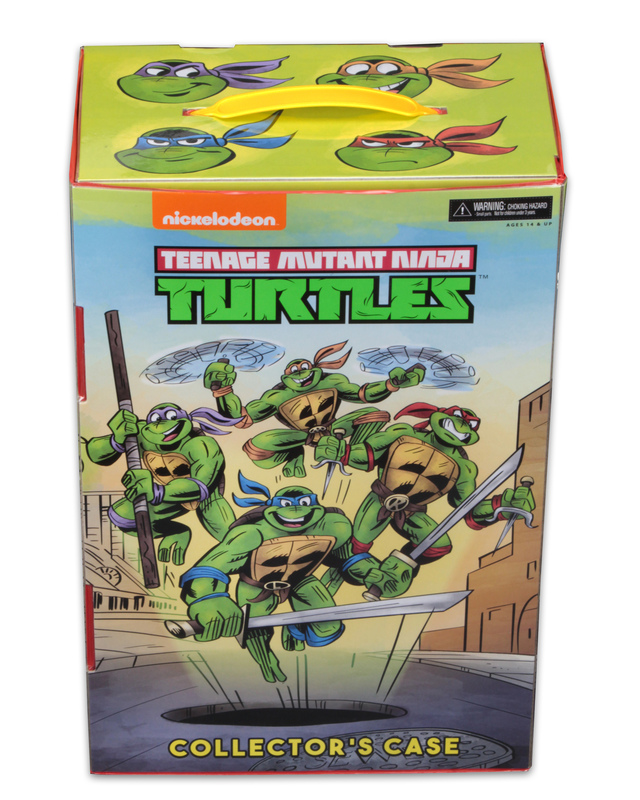 To celebrate 30 years of the classic Teenage Mutant Ninja Turtles cartoon, we needed to create something suitably epic, like this massive, limited edition collector’s set with carrying case! 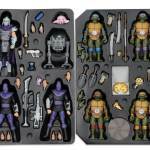 It includes 8 action figures (Donatello, Leonardo, Michelangelo, Raphael, Shredder, Krang with Bubble Walker, and 2 Foot soldiers) and tons of accessories, all packed into two figure trays in a vinyl carrying case. 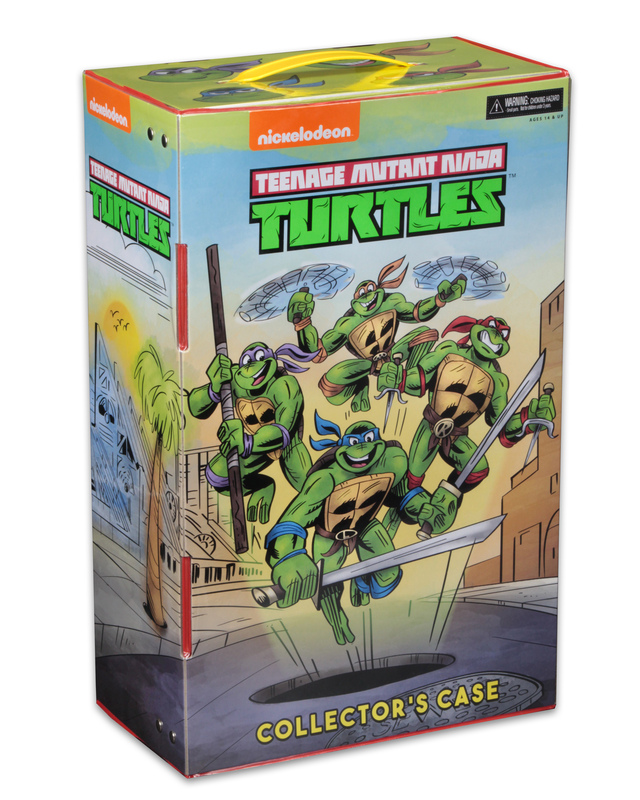 The case features original artwork by Ken Mitchroney, Archie Comics’ “Teenage Mutant Ninja Turtles Adventures” artist. Figures stand in 7” scale and are fully articulated. Case measures approximately 16” H x 10” W x 5.5” D.
Read on for the official photos and see a special gallery at the link above. 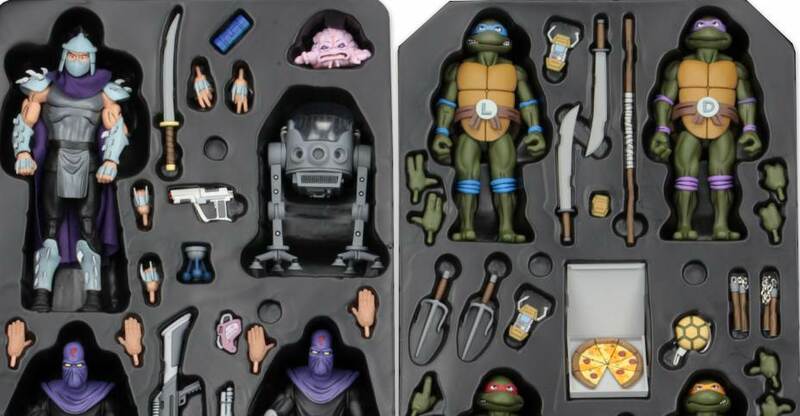 NECA Teases 6" TMNT Figures - Possible SDCC 2017 Set? This is nonsense. Make them a normal frickin' release!! They can't. That's Playmates domain. they did say their SDCC releases will be a lot easier to get this year. Best news ever! Can't wait for the full reveal. 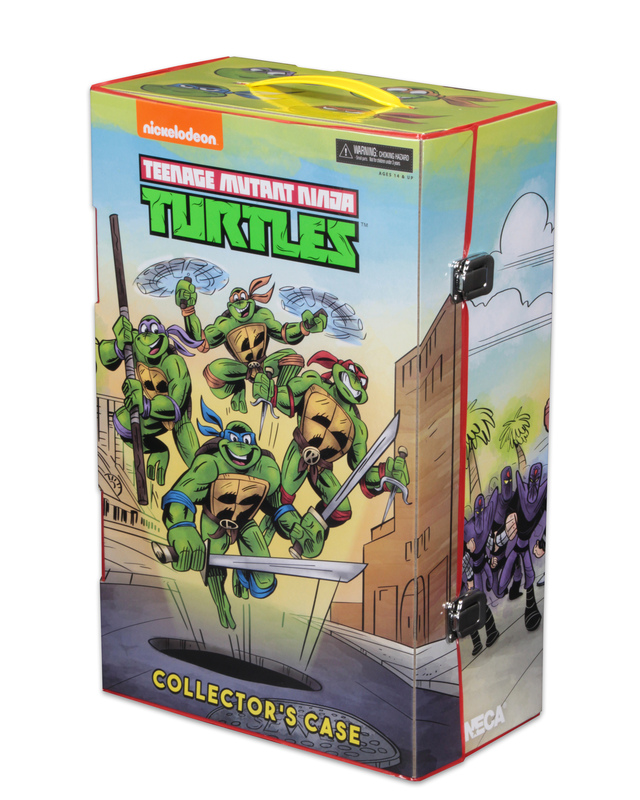 Even if this set is $100 it's much more affordable than a set of the SH turtles. Not normally a Turtles guy, but damn. Might have to try and snag this if it can be acquired for less than the down payment on a car. 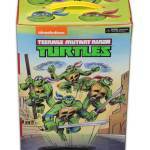 I would jump on these in a heartbeat, been meaning to get me a set of classic looking turtles. 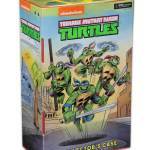 Was the molds that were used for the video game set last year never released as classic turtles before? Were they new? Damn! 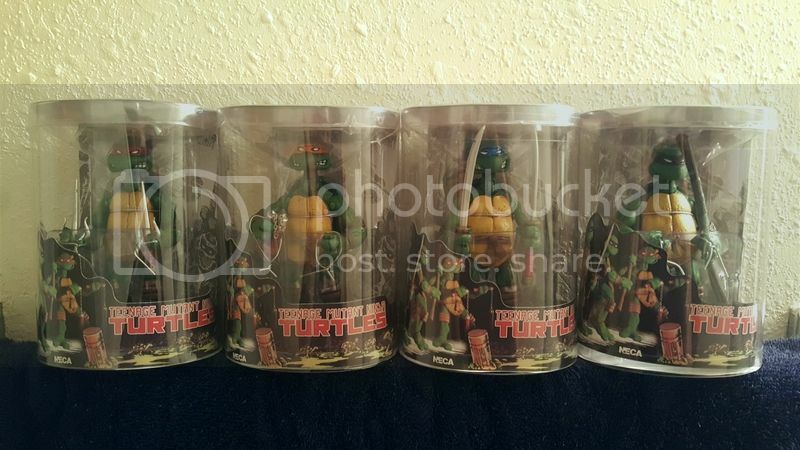 I paid around $350 for the SHF Turtles... I'm guessing these will cost less. Gotta get them! They do look good, but would have loved for them to kind of downscale their current sculpts on the 1/4th ones. Hope it does not turn into the hell it was to get last year's set. Do licenses go by scale too? Master License Holder gets to dictate it however they see fit or whatever they see as "competition" for their main lines. Some companies dictate solely by size, while other dictate by which stores it can be sold at, countries it can be sold in, material used, points of articulation (I kid you not), characters, etc. Ive heard even what factories they can be manufactured in can also be a factor. I always assumed it was the proprietor of the property that dictates all that stuff. When a company gets a Master Toy License, that means that they can dictate just about everything toy related to that property. But there are variations for sure. But, a Master License is usually sold to someone who's going to aim at broadest market possible and then they can work out with other licensors on additional product. There are ways you can get around it at times, but usually the master license holder will still have a say in some form or fashion. Third teaser added to the news post. They look like playmates classic turtles, no? I mean obviously not identical, but similar. Maybe these would possible have better articulation? Better accessories? I don't see a huge difference here. 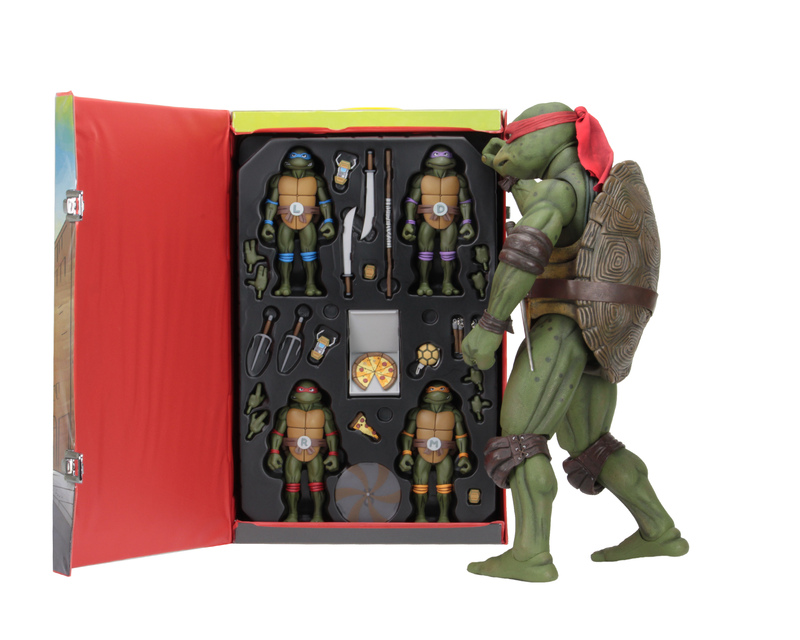 NECA has proved time and time again they can work around licenses giving us cool little treats. i.e. 7" Reeve Supes, Keaton, West & Bale Batmen, to name a few. 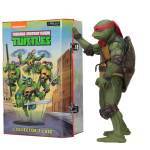 One can only hope they will eventually shrink down their formidable 1/4 movie Turtles. I was thinking the same thing. Having those, I don't see a pressing need to get these as well. I guess we'll see for sure when they do a full reveal. 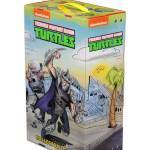 There's a teaser somewhere for a SDCC Shredder too. 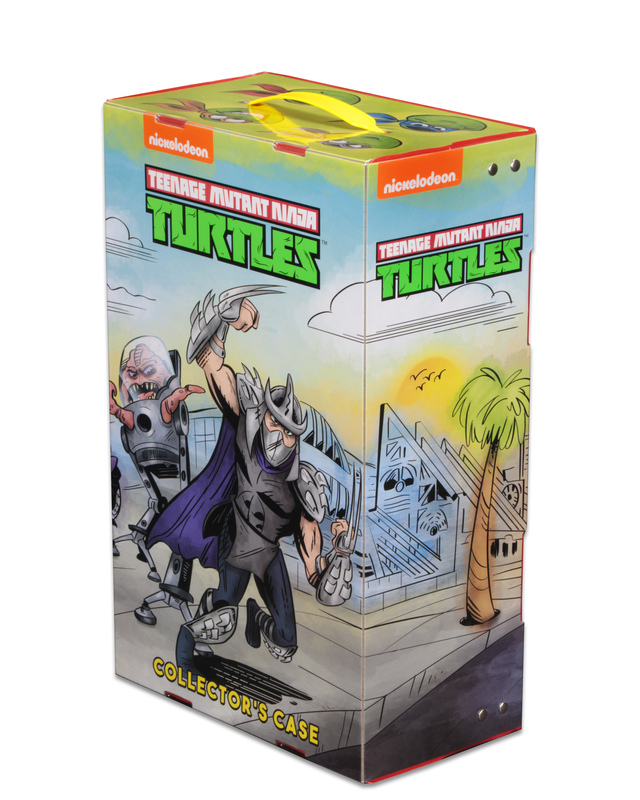 Nothing definitive yet in terms of look, but if it's the shredder we should have gotten for the classic line, then I'm in. Now the Shredder is definitely an interesting thought. The question is, what kind of hoops am I going to have to jump through to get it, and the costs? 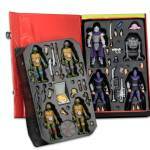 I already have the NYCC exclusive Mirage Foot Clan set, so I'm pretty doubtful that they can top that. All times are GMT -4. The time now is 4:56 AM.